Greens,Baby Beets & Bagel Salad is a crunchy salad made with mesclun greens, baby beets, & seasoned bagel croutons. Balsamic Vinaigrette is drizzled over the salad and thinly sliced smoked Gouda cheese adds a smoky flavor. Everything bagels are cut into small bite sized pieces, tossed in soy sauce and olive oil then baked until crunchy. Great salad for any occasion. 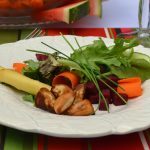 Easy to make fresh salad with mesclun or baby spring mix, steamed fresh baby red beets, curled carrot slices, diced cucumber and gouda cheese. The baked “Everything bagel” adds great flavor and additional crispness to the salad. Cut bagels into small bite-sized pieces using kitchen shears. In small zip lock bag, place soy sauce and olive oil mixture, toss croutons in this mixture to coat. Bake on baking sheet at 500 degrees for 2-3 minutes. Watch carefully not to burn croutons. Remove from oven and place on top of salad. Serve Balsamic Vinaigrette in a separate dish or drizzle salad with dressing. Garnish salad with X crossed 4 chive stems on each salad. If you want to make plain bagels with everything seasoning, try this.. Brush plain bagel topping with egg white and dip bagel into Everything seasoning mix, bake at 400 for 5-8 minutes until bagels are slightly golden.